As a free subscriber, you've been missing some great stuff: Big Tech's oil addiction, Mnuchin's Russian reversal, and more. Upgrade to a paid subscription and get Popular Information four times per week. It's just $6 per month or $50 for an entire year. 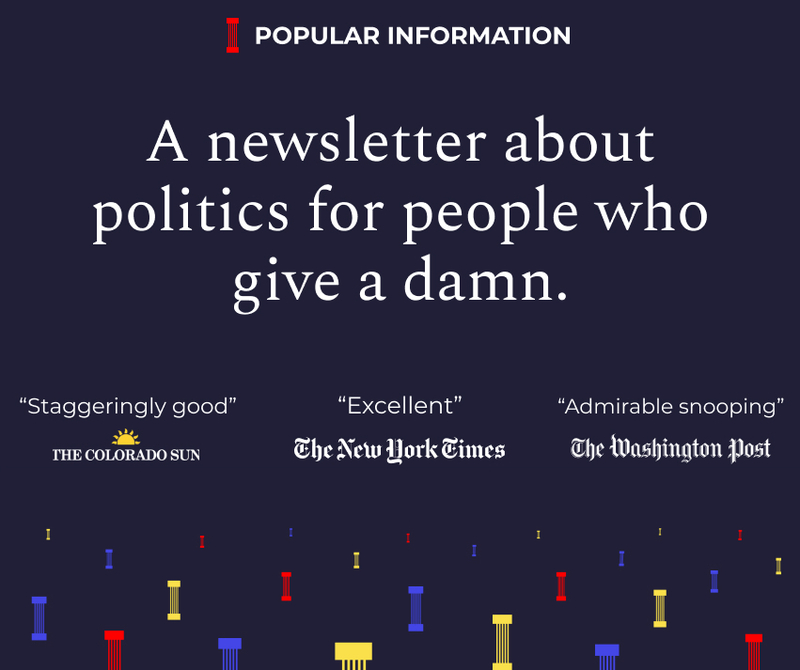 Since Popular Information launched in July 2018, it has demonstrated the ability to hold the powerful accountable and create change — from Tucker Carlson to Steve King to Cindy-Hyde Smith to the election fraud scandal in North Carolina. Even more is possible with your support. Contact me with any questions at judd@popular.info. It was proof, we were told, that Trump could make good on his promises. Foxconn, the Taiwanese electronics giant, was building a new factory in Wisconsin -- and manufacturing jobs were coming back to the United States. Yes, it took $4 billion in subsidies and incentives from former Wisconsin Governor Scott Walker (R) and the state's Republican legislature. But it was happening. Trump traveled to Wisconsin for the groundbreaking on June 28, 2018. "Moments ago, we broke ground on a plant that will provide jobs for much more than 13,000 Wisconsin workers," Trump said. "And I will tell you they wouldn’t have done it here, except that I became President, so that’s good." He claimed the "plant will manufacture state-of-the-art LCDs, adding an average of $3.4 billion to the state’s economy every single year." Trump said the new facility was proof he was "reclaiming our country’s proud manufacturing legacy" and "restoring America’s industrial might." "This is the Eighth Wonder of the World," Trump proclaimed. "In Wisconsin, we’re not building a factory. You can’t use a factory to view our Wisconsin investment," Woo said. Instead, the facility would be "a 'technology hub' in Wisconsin that would largely consist of research facilities along with packaging and assembly operations." As it is now conceived, "three-quarters of Foxconn’s eventual jobs will be in R&D and design" instead of "blue-collar manufacturing jobs." The pace of hiring has slowed dramatically. The company initially estimated it would hire 5,200 people by 2020; the new estimate is 1,000. In 2018, the company hired just 178 workers. The company reportedly considered "bringing in personnel from China...as it struggles to find engineers and other workers" in Wisconsin. Marc Levine, a senior fellow at the University of Wisconsin-Milwaukee's Center of Economic Development, called it "one enormous bait and switch." Levine noted that Foxconn is a manufacturing company, not a research and development company, and doubted that it would ever employ 13,000 people at a facility focused on research. Foxconn was lured to Wisconsin with billions of taxpayer dollars. If it fails to meet hiring and capital investment targets, it may forfeit a portion of that money. While Foxconn won't realize the full $4 billion in incentives if it fails to create jobs or make investments, Wisconsin residents are still paying a high price. Meanwhile, Foxconn has already begun to reap the rewards. Racine County, for example, pledged $764 million in tax incentives, including buying the land for the facility and giving it to Foxconn for free. The state government will also spend $400 million to expand roads around the facility, and the federal government has committed to $160 million in infrastructure improvements. As part of the deal, Republicans in Wisconsin essentially eliminated all corporate tax liability for Foxconn. So whatever "credits" Foxconn does qualify for will essentially be cash payments to the company. "Not only do we not obtain the revenue, we pay the company," State Representative Gordon Hintz (D), a critic of the deal, said. Property owners have already had their land seized by the state, and paid for by taxpayers, to make way for Foxconn's facility. "We wiped out entire neighborhoods," Sandy Weidner, a Racine city alderman, told the Wall Street Journal. Kimberly Mahoney's family is the only one left in their 13 home subdivision. "Now it’s just us and our neighbors left, and they are moving out this weekend. The rest of my neighbors were bullied and intimidated enough to sell … My daughter had friends across the street to play with and now it’s just us," Mahoney told NBC News. In 2013, Foxconn promised to spend $30 million and create 300 jobs in Harrisburg, Pennsylvania "to establish a high-end technology management facility." It was never built. In recent years, Foxconn has pledged investments of $100 million to $1 billion in Brazil, Vietnam, and Indonesia, as well as Colorado, Louisiana, and four other states but never followed through. Foxconn isn't a reliable economic partner, but Trump's economic policies haven't helped matters. Apple is Foxconn's largest customer, so Foxconn may be hesitant to create a massive new LCD manufacturing plant in Wisconsin due to lagging demand for the iPhone. Apple's issues are multifaceted and partly a reflection of the maturing smartphone industry. But its biggest problems are in China which is reeling from a weakened economy, due in part to Trump's trade war. While Trump's trade policy is based on the simplistic notion that the United States will benefit from being "tough," the Foxconn decision illustrates these actions can hurt American workers -- the very people Trump says he's trying to help. Kelly Lietz, vice president of marketing at the Wisconsin Economic Development Corporation, which made the deal with Foxconn, hinted at this in a statement. "Foxconn’s long-term success both globally and within Wisconsin is centered around the alignment of its business model with ever-changing global economic conditions, including evolving customer demands," Lietz said. Foxconn’s decision underscores the impossibility of Trump's fundamental promise -- to Make American Great Again by restoring the manufacturing economy. States are throwing billions at multi-national corporations to turn back the clock. But while manufacturing jobs have ticked upwards since 2009, "they are still only back to where they were in 1941, when the population was less than half of today's," and well below the manufacturing peak of 1979. The appeal of manufacturing is obvious. Those jobs supported a robust middle class and economic mobility. But, for the most part, those jobs are not coming back. Policymakers need to focus on improving the conditions for workers in today's economy. How much is your privacy worth? $20 per month. Facebook has been secretly paying teens and adults $20 a month to turn over all their online activity to the company, according to an explosive report in TechCrunch. The program, which targeted people aged 13 to 35, required them to download an app on their phone "and give [Facebook] root access to network traffic...so the social network can decrypt and analyze their phone activity." The app gave Facebook access to "private messages in social media apps, chats from instant messaging apps – including photos/videos sent to others, emails, web searches, web browsing activity, and even ongoing location information." It "even asked users to screenshot their Amazon order history page." After publication, Facebook told TechCrunch it was shutting down the program. Apple, however, said that Facebook violated its app policy and banned the "Facebook Research" app from its platform. Previously, Facebook used a similar app, Onavo, to track users’ habits but Apple pulled it over privacy concerns. Onavo gave Facebook the insight to spot the rapid rise of WhatsApp, which it then paid $19 billion to acquire. Users downloaded the Facebook Research app outside of the app store, which made the new effort more opaque. Facebook, which has been battered with criticism over the last year, defended its conduct. "Like many companies, we invite people to participate in research that helps us identify things we can be doing better. Since this research is aimed at helping Facebook understand how people use their mobile devices, we’ve provided extensive information about the type of data we collect and how they can participate," the company said in a statement. The data collection business is quite profitable. On Wednesday, the company announced it raked in over $16 billion in revenue in the last quarter of 2018.